In sports you have your starters, usually the star players; a few others who are in regular rotation and then there are your benchwarmers. Not everyone can be a starter, but everyone should aspire to be in regular rotation. Everyone should have the desire to get in the game. Right? Some might say that benchwarmers get a sweet deal, especially if they’re on a winning team. 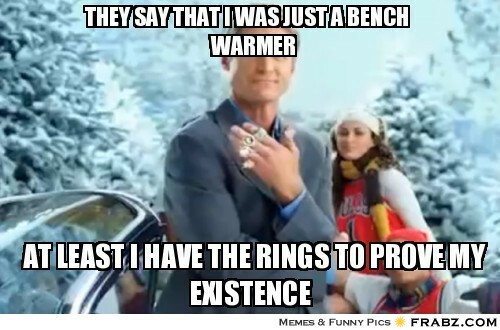 The benchwarmers still get a championship ring. This is totally not the direction I was going with this, but as I write…There is a shift in perspective. Is getting a championship ring the only benefit to being in the game? Name Recognition – You become known as a team player. Reputation – Depending upon how you play the game, there will be an expectation of how you’ll perform. If you’re consistent, others can predict how productive you’ll be. Camaraderie – A trust and friendship develops from the shared experience of working together towards a common goal. Endorsements – A good reputation could lead to lucrative endorsements that open doors for you outside of the arena. Fitness – More game time, equals more personal development. Knowledge – You get to know things about yourself and your teammates that sharpen your skills. Growth – Personal development through making mistakes and triumphs helps you mature in the game, learn your strengths and play to them; minimizing your weaknesses. This is what I came up with just brainstorming. I’m sure you could identify some others. I know, I know. What are you getting at Celine? I’ve been struggling lately with admiring those who sit things out instead of getting involved. I don’t know how to do that. Most of the time when there is a call for volunteers, I take the call personally. I’d been getting to the point where I’ve been admiring the bench. Who does that? However, what happened to me in the midst of writing this week is that I need to have yet another shift in perspective (that’s been happening a lot lately). Going forward, I need to use what I’ve learned from being in the game to identify what position I’m best at playing and play to my strengths. There are some folks who are blessed to be all-around players, but does that really benefit the team? How does playing several different positions benefit the team, when I may be place-holding for a benchwarmer who hasn’t been allowed a chance to shine in a spot I’m only filling in halfheartedly. Giving someone else a chance to step up could be better for all involved. Me playing the position I’m best at, and leaving the others to those better qualified would definitely lead to better overall success. This entry was posted in Celine Saturdays and tagged bench warmer, benefits, Celine Parker, Celine Saturdays, spiritual gifts, strengths, team player, team work. Bookmark the permalink.